An object is a software bundle of related state and behaviour. You can use objects to model real-world objects (e.g. car, house, person, plant, robot, etc.) or abstract concepts (e.g. consumer, producer, listener, etc.). The state of an object is identified by its fields (e.g. name, colour, position, etc). The behaviours, instead, are actions that take place through methods (e.g. move, shoot, turn). * The constructor is the method called when a new object is created. * Returns the name of this person. * Name is a String, so we specify that! A class is a blueprint or prototype from which objects are created. In the real world, you’ll often find many individual objects all of the same kind. There may be thousands of other bicycles in existence, all of the same make and model. Each bicycle was built from the same set of blueprints and therefore contains the same components. In object-oriented terms, we say that your bicycle is an instance of the class of objects known as bicycles. You can then use this class to create as many instances of a Bicycle as you wish. Body - Carries the gun with the radar on top. The body is used for moving the robot ahead and back, as well as turning left or right. 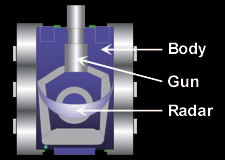 Gun - Mounted on the body and is used for firing energy bullets. The gun can turn left or right. Radar - Mounted on the gun and is used to scan for other robots when moved. The radar can turn left or right. The radar generates onScannedRobot events when robots are detected. * but you can have me in multiple lines! * This is a javadoc comment. thisIsACustomMethod(); I am calling a method! * This event is automatically called if there is a robot in range of your radar. * Note that the robot's radar can only see robot within the range defined by Rules. fire(3); // fire is a method of this class. 3 is the energy of fire. * This method is called when your robot your robot is hit by a bullet. * This method is called when one of your bullets hits another robot. * This method is called when one of your bullets misses, i.e. hits a wall. // This takes away energy from me. I should avoid walls! * This method is called if your robot dies. * Actions will have no effect if called from this section. * out when the robot is killed. * This method is called when another robot dies. * You should override it in your robot if you want to be informed of this event.